Looking for more information on Springbot, a big data analytics and marketing automation tool for SMB eTailers on Magento? Well check out Groove's interview with Co-founder & CTO, Joe Reger! As Marketing & Channel Manager at Groove, one of my chief responsibilities is to meet and research prospective third party companies that we can leverage to help drive revenue for our clients. If you’re familiar with the eCommerce space, then you’d know that this is much easier said than done as there are about a billion (cue Dane Cook’s ‘Exaggerating Girlfriend’ joke reference) different products and extensions out there, many of which really aren’t worth the time-investment to learn about based on expected ROI. 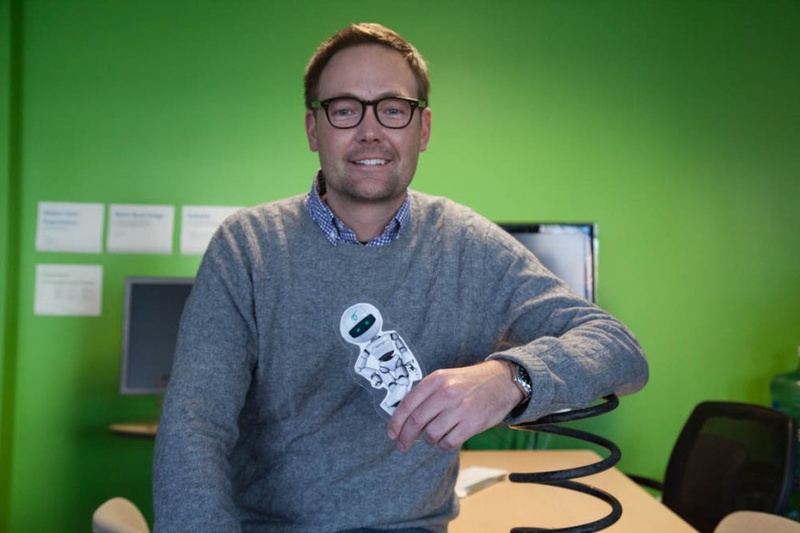 Recently, however, I had the good fortune to meet Springbot who really impressed me with their SaaS-based marketing automation and big data analytics platform geared toward SMB eTailers on Magento. Aside from having a great product, they’ve also been named a Magento Gold Industry Partner and have been touted as a “Staff Pick” in the Magento Commerce marketplace. So, I reached out to Co-founder Joe Reger and interviewed him about their background and what they’re doing these days to disrupt the Magento landscape. Enjoy! Q. What's your role with the company? I am the office geek... otherwise known as Co-founder and CTO. Q. How would you describe Springbot in an elevator pitch? 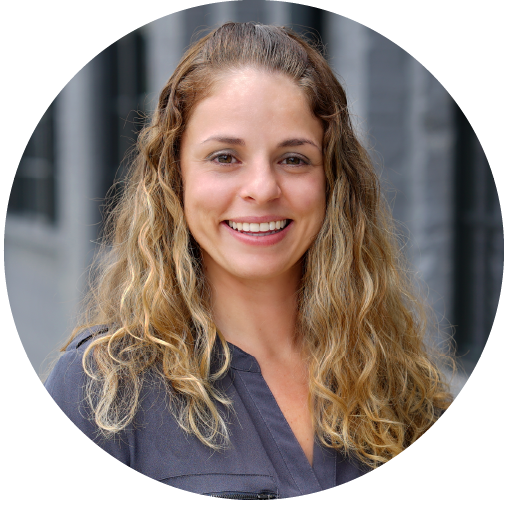 Springbot is a SaaS-based eCommerce marketing platform that helps online stores grow their revenue by taking smarter, data-driven marketing actions. Our product integrates and makes simple the data, content, and multi-channel marketing tools (social, online, email, etc.) eCommerce businesses need to drive more traffic and conversions, track revenue attribution by channel, and increase overall revenue. Simply put, we help SMB eCommerce stores compete, and win, against large enterprises so that they can market smarter, not harder. Q. Can you talk about how the idea of Springbot was born? Our passion is helping small and medium size businesses grow. We knew that there was a huge gap between what the big guys like Amazon were doing with advanced technologies and what the small to medium sector could do. We set out to fill that gap with artificial intelligence, machine learning, and predictive analytics packaged in an easy-to-use and actionable tool that really has an impact for our market. Q. What's your favorite feature of Springbot? Our army of marketing robots. They work all day and night crunching store data to find the insights that fuel our store owners’ dashboards. Of course, they’re actually complex software algorithms… but we like to give them names and think of them as little marketing robots that work while our store owners golf, go to the beach, or just relax with their families. Q. How many clients does your army of marketing robots serve at the time of this interview? We’re currently helping hundreds of clients, and growing, in just about every industry imaginable. Q. Out of those clients, are there any particular case studies that you like to highlight? Again, our passion is helping SMBs grow their online stores by giving them affordable access to big data and marketing tools that in the past, were only available to large enterprises. My favorite case study, Harnessing the Power of eCommerce Demographic Data, really highlights how we have helped eCommerce SMBs leverage customer data (like age, gender, marital status, and income) so that they can tackle the challenge that is selling and winning with their products online. One customer in particular, First Aid & Safety, found that after leveraging the data we made available to them, they had an increase in their online sales by 300% in a 6-month time period with an ROI increase of 112% from their email marketing campaigns alone. Pretty staggering results in my opinion. Q. Diving more into the customer data that you’re able to make available with the platform - can you talk about how you guys actually capture that? Customer, prospect and purchase history data that’s captured in Magento is connected to our “Big Data” engine. In a nutshell, this engine is actually comprised of other software that we take advantage of and leverage within Springbot, notably: RapLeaf, Fliptop, and mongoDB (in addition to Google Analytics). 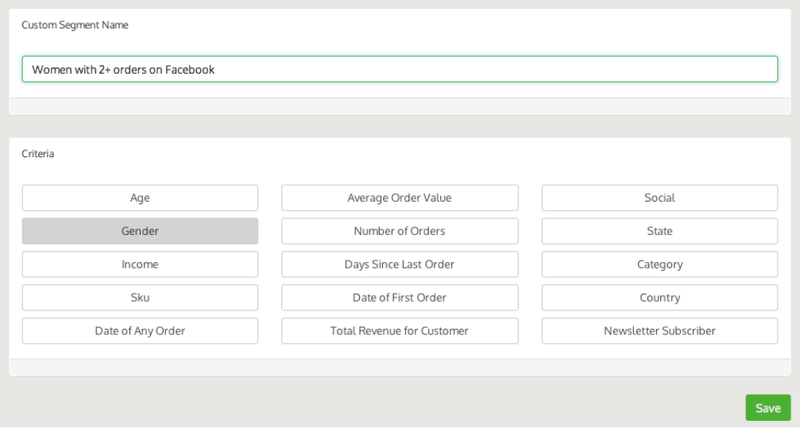 As a result, you’re able to create custom segmented lists for your customers based on this data that can be used for either pure analysis purposes or for emails (or really anything else that you can think of for smarter, more personalized marketing). Here’s a snapshot of some of our prebuilt segmented lists that come out-of-box, though the possibilities for list creation are nearly endless. Q. Can you talk more about the email side of the product – what can be automated and are you sending emails out of Springbot or an external email service provider? 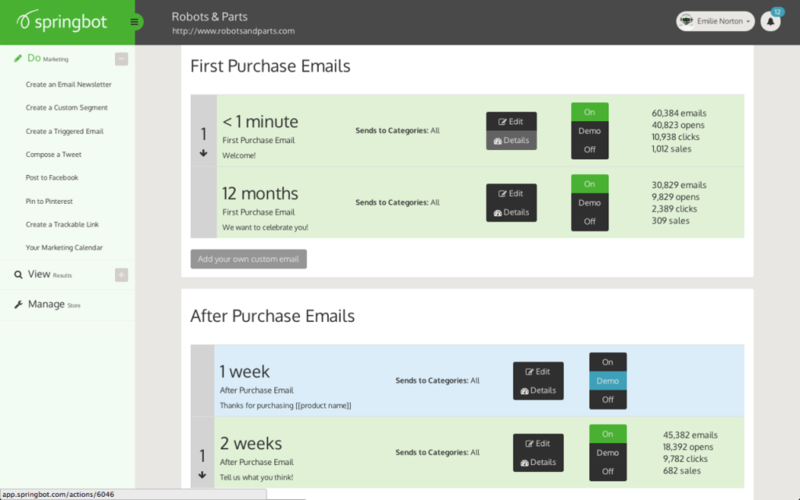 From an automation standpoint, you can set up email workflows for account creation (cue welcome series), first-time purchases, abandoned carts, and anything else that you’d want based on customer interaction with your site. As for the actual sending of emails, we’ll integrate with the email service provider that you’re already using. If this happens to be MailChimp, our API will connect directly so that you’ll never have to worry about importing/exporting lists to CSV or other file types. If using another email provider (i.e. Constant Contact, iContact, etc. ), you can import/export your segmented customer lists within Springbot to use within these platforms. Q. Your integration with MailChimp sounds awesome. You also integrate with AdRoll, correct? Q. Can you share any insights about what's in store for Springbot moving forward this year, as a company or with features? This past May, we launched Springbot 2.0 with a sleek new design, simplified dashboard navigation, and enhanced features for our customers. Next on the horizon is a continued focus on continually bringing our customers new marketing recommendations that are automated in our dashboard. The new recommendations, fondly referred to as “recos”, include launching automated recommendations based on helping to increase triggered email performance, email subject line testing, and content optimization. We also plan on launching custom segmentation insights that explore the intersection of demographic data and sales data. 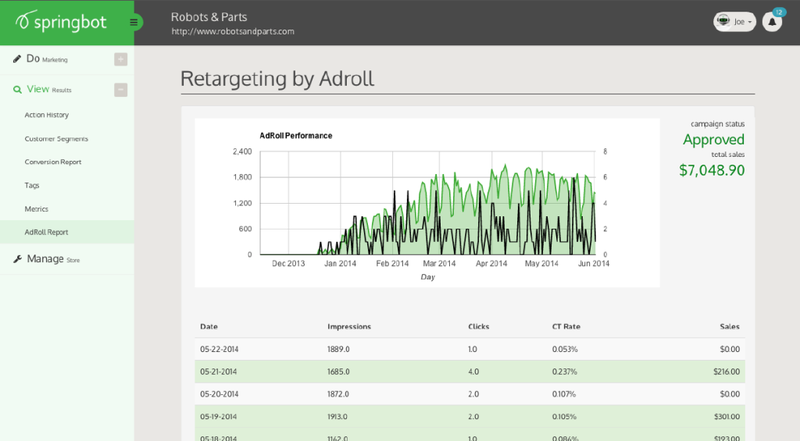 And as if giving Springbot a mini facelift was not enough, we are also launching a new tool in July that gives eCommerce merchants a powerful ‘snapshot’ of their store’s demographic data for free. The tool, Free Demographic Snapshot, includes a sample report on the age, gender, and households with or without children so that users can leverage their customer data to optimize their marketing campaigns. If anyone is interested in learning more about this tool, they’re welcome to email us at freedemographicsnapshot@springbot.com and we’ll send an update as soon as it's available. If you’re looking for a multi-faceted tool for Magento that can provide you with great big data analytics about your products and customers while also enabling you to take advantage of various marketing automation channels, I highly recommend checking Springbot out. My gut instinct (speaking personally) says that these guys are going to continue to disrupt the Magento landscape and really change how SMB eTailers are able to personalize their marketing strategies. To contact Joe with any follow up questions, you can email him directly at jreger@springbot.com or comment below. Of course, if you need a Magento Gold Solution Partner that can help you configure the Springbot extension and set up your marketing workflows, don’t hesitate to contact us at Groove!